Part two of a three part series on underrepresented groups in policing. Read part one here. This week, I discuss another marginalized group within policing: lesbian, gay, bisexual, and transgender, and queer (LGBTQ) officers. 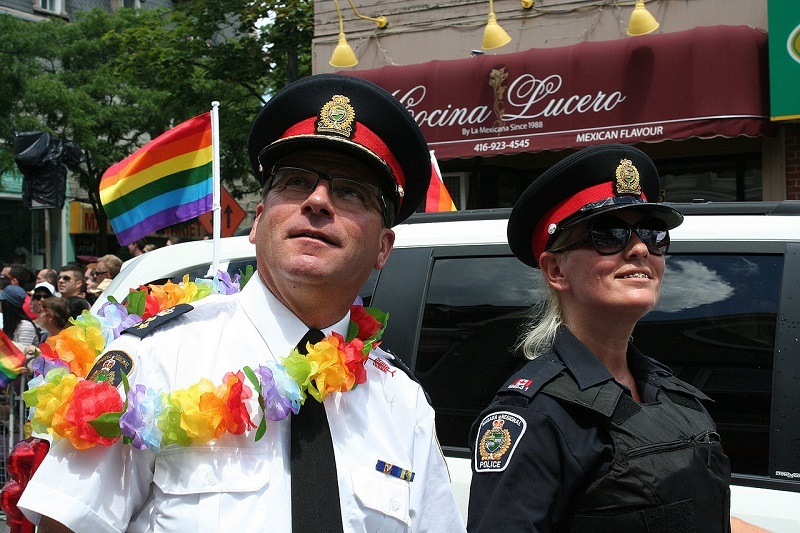 LGBTQ police officers are a notoriously under-researched demographic, especially in Canada. In fact, it was only in 2014 that a landmark study was published by Joe L. Couto at the Royal Roads University—the first piece of Canadian research to examine the lives of queer police. This article will primarily focus on the contents and insights of Couto’s study. In the study, Couto considers how a police culture that is overwhelmingly defined by white, working class, heterosexual males “is perceived by and impacts the workplace and career experiences of LGBTQ police officers in the Province of Ontario.” He reviews the history of relations between police and LGBTQ communities in North America, citing “discrimination, prejudice, and harassment” as key themes characterizing this relationship from the very beginning of the modern gay rights movement. In Toronto for instance, the police raided four bathhouses previously considered as a safe gathering space for gay men in February 1981. They arrested 286 men and created over $35,000 in damages—leading the gay community to accuse them of discrimination and eventually holding the city’s first ever Pride event later the same year as a form of protest. Reviewing the scarce literature on the topic, Couto finds various studies suggesting that similarly to female officers, LGBTQ officers live dual lives in order to function within a workplace structure based on masculine heterosexuality as the norm. They are compelled to hide traits associated with “being gay” while on the job, feeling pressured to conform to aggressive and traditionally masculine “cop-like” behaviours. Through 21 interviews with LGBT officers of various ranks across Ontario, Couto comes to the following conclusions. First, most interviewees feel that police culture in Ontario continues to be conservative and male dominated. However, most also feel that Ontario police have become more inclusive over the last 20 years as more women, racial minorities, and LGBTQ people are recruited to and promoted within the police force. In addition, younger heterosexual recruits are more accepting of LGBT officers, with organizational resistance towards inclusivity primarily coming from middle managers 50 years old and older. These results encourage some optimism with regards to LGBTQ inclusivity within Ontario policing. Nonetheless, Coulo does emphasize that police artefacts (policies, procedures, and external communications) continue to be conservative and poorly reflective of LGBTQ officers. He suggests that these too will have to adjust as police culture continues to shift towards greater LGBTQ inclusivity. While this study is dated, it does provide a solid foundation upon which to consider several recent news stories relating to Canadian police and the LGBTQ community. For instance, this past summer, Owen Sound police were praised for raising a pride flag in response to the Orlando mass shooting in a gay nightclub when the town’s city hall refused to do so. Also, Fredericton police set up a Pride liaison committee in July 2016, to help increase knowledge of the LGBTQ community ahead of the city’s pride festival later the same month. Both of these examples seem to reinforce Coulo’s findings that Canadian police culture is slowly becoming more inclusive towards LGBTQ people. At the same time, a gay police officer was asked not to march in uniform at the St. John’s pride parade in Newfoundland, possibly due to negative associations with the profession. As well, there have been vocal calls for police to withdraw from participation in Pride Toronto because of their perceived harassment of black LBGTQ youth—an issue complicated by the involvement of two minority groups (blacks and LGBTQs)—both underrepresented in policing. These instances corroborate Coulo’s other findings that despite slow changes, Canadian police culture continues to be dominated by mainstream masculine values and demographics that do not accurately reflect the diversity of society today. These dominant values in turn perpetuate both real and perceived discrimination against minority group officers and members of the public. Ultimately, police relations with LGBTQ communities will only become more significant as the Canadian social landscape becomes more progressive and citizens seek law enforcement institutions which are more representative of the population. During this transition, LGBTQ officers will undoubtedly be a valuable resource for understanding and addressing the needs of the LGBTQ community. However, policing organizations will also have to change their established cultures and practices. Instead of permitting alienation of and discrimination against LGBTQ officers who may be some of their best assets, they will need to create new spaces for these officers within the institution, and embrace officers’ LGBTQ identities in their entirety. Photo: Toronto Pride 2012 (2012), by Anonymous via Flickr. Licensed under CC. Making Improvements to Women’s Rights In Canada and Abroad.